The next light rail line proposed for the region is currently estimated at $2.64 billion to $2.86 billion, with half the money expected to come from the federal government. A route for the proposed Southwest Corrdior MAX line was recommended by the Metro steering committee advising on the project on Aug. 13. The regional government is planning the project between Portland and Bridgeport Village in Tualatin through Tigard. If approved and funded, it will be built, owned and operated by TriMet. • Leaving Portland on Southwest Barbur Boulevard instead of Southwest Naito Parkway. • Running the trains through the middle of Barbur Boulevard instead of alongside Interstate 5. This decision would not reduce the number of lanes on the road. • Building continuous bike lanes and sidewalks on Barbur, until 60th Avenue, even in the Barbur Woods area. • Replacing the Newberry and Vermont viaducts, which are not up to current street codes. The projects would be done by the Portland Bureau of Transportation and the Oregon Department of Transportation. 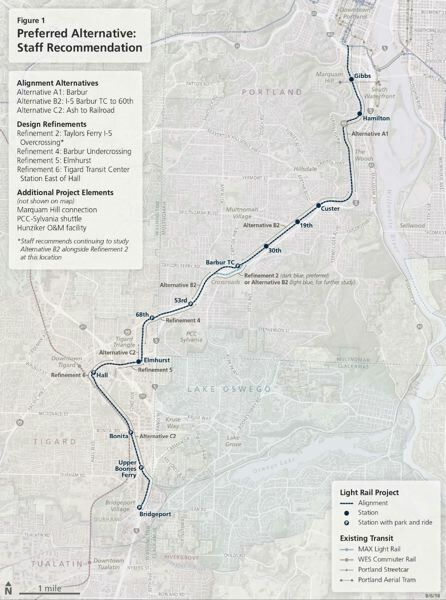 • In Tigard, running the proposed train on 70th Avenue until Elmhurst Street, crossing over Highway 217 and running east of Hall Boulevard, then travelling next to the existing train tracks until it splits off to Bridgeport Village. In addition, the 12-mile line would have 13 stops, seven park and rides. it would also include a "transitway" from downtown Portland to Southwest Gibbs Street on Barbur to speed up buses to Hillsdale. Still to be finalized are a connection to Oregon Health and Science University on Marquam Hill, a shuttle service to the PCC-Sylvania campus, and the redesign of bridgehead at the western end of the Ross Island Bridge. The route recommendation marks a major milestone for the Southwest Corridor Plan, which must still be approved by the Metro Council. The decision will help determine the final cost of the project, which was most recently estimated at $2.64 billion to $2.86 billion in 2024 dollars, the estimated midpoint of its construction. Metro and TriMet are counting on requesting and receiving half the funding from the federal government. Metro has agreed to submit a yet-to-be-finalized regional transportation funding measure to the November 2020 general election ballot to help pay for the project. Land owners along the route have been mailed noticed that their properties may be required for the project. Hundreds of homes and businesse are expected to be aquired. Metro promises to minimize the purchases once the final route is approved. In making the recommendation, the committee considered the Southwest Corridor Draft Environmental Impact Statement, feedback from the public and staff recommendations from partner agencies informed the route decision. Metro received approximately 1,015 comments during the DEIS public comment period. People gave spoken testimony, wrote letters, sent emails and filled out web surveys. To read a previous Portland Tribune story on the project, visit tinyurl.com/yc7kzqss.